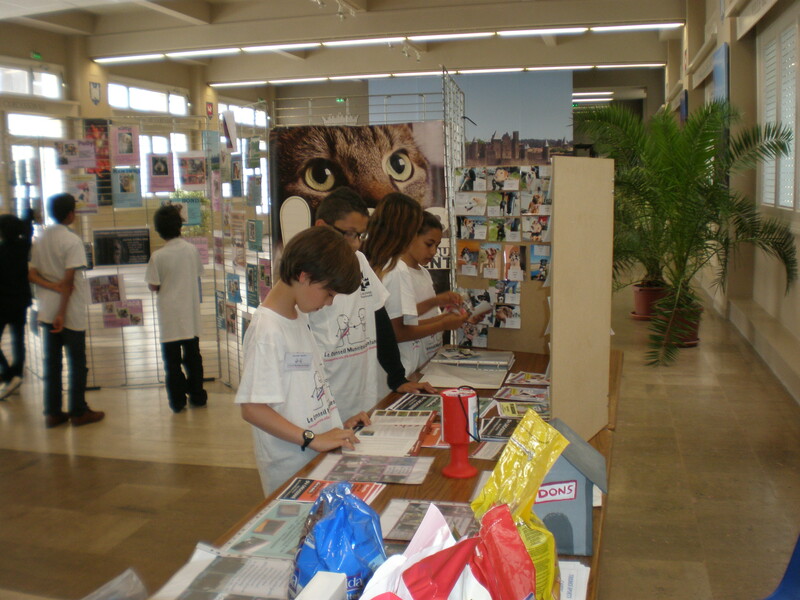 Home / Latest News / Several hours and 400kg of dog and cat food later…..
Several hours and 400kg of dog and cat food later…..
Well, today was day two of the collection to benefit the SPA organised by the Children’s Council of Carcassonne. I spent several hours there, along with a number of volunteers and lots of very enthusiastic children. It was about as noisy as the refuge to be honest, but loads of fun. 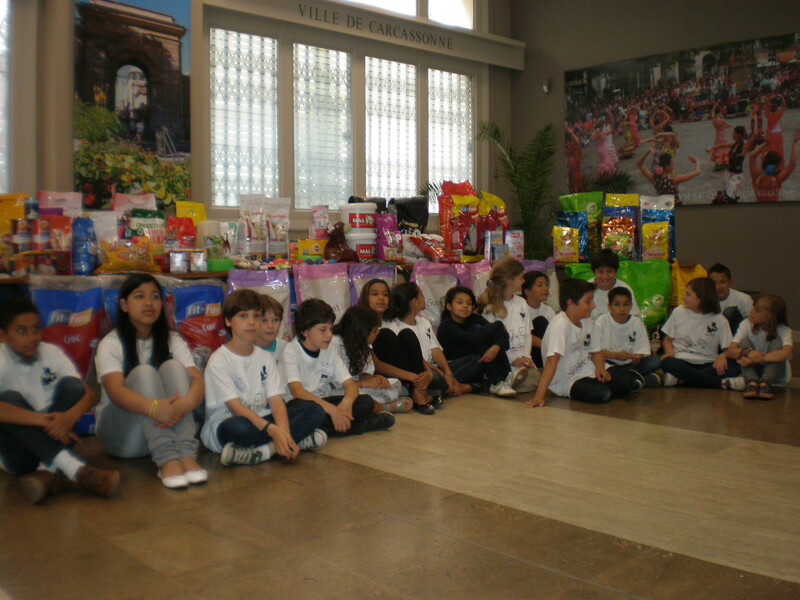 Here are some photos of the children, along with some of the 400 or so kg of croquettes that were collected during the two days. 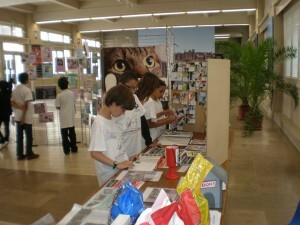 The main aim, as well as collecting dog and cat food, was to make people aware of the problems faced by the refuge, especially as summer approaches and people tend to abandon their animals. Lots of journalists attended and asked questions of the children, all of whom were extremely well- informed about the issues. Oh, if only they will take this awareness with them into adulthood! This is what 400kg of dog and cat food looks like! Thanks kids! They will Darcy, they will. Believe me. I can remember doing a ‘Save the Rhino’ walk with one of my classes, and all the attendant build up of conservation and looking after the world. We raised £100 – a lot of money in those days. Many years later I met one of the children, now a parent. ‘Hello’ she said ‘Remember me, I walked to save the Rhino, I am still a member of Greenpeace, and I will never forget what you told us. I am teaching my kids the same things’ That was the best thing ever to happen to me. Those children have been involved, they will remember, it is a positive move that will in time, change the world. I hope you are right, Nicki. I think a couple of them are going to come and volunteer dog walk with their parents. Get ‘e m young, that’s what I say!